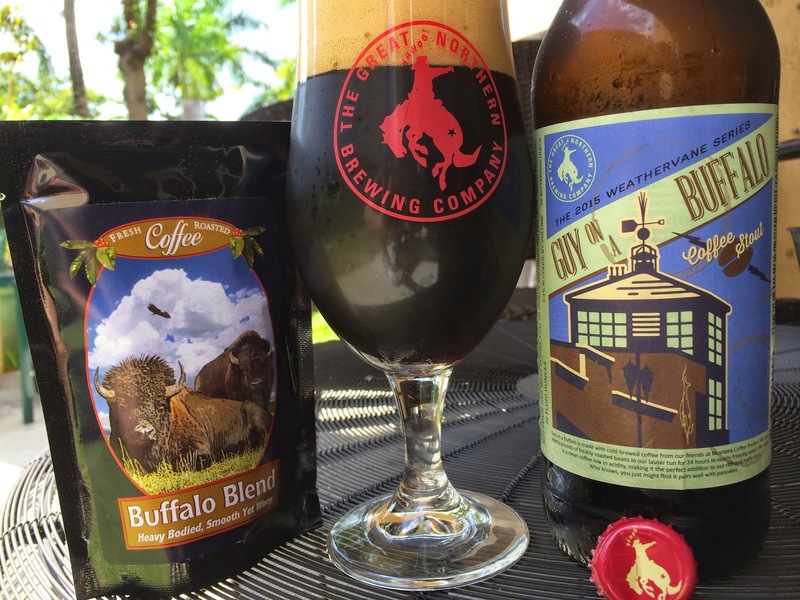 Today I'm checking out Great Northern Brewing's Guy on a Buffalo Coffee Stout. The brewery sent me a sample of the beer along with one from Montana Coffee Traders, the makers of the coffee they used while brewing the beer. This is part of their 2015 Weathervane Series and is packaged in a 22 ounce bottle which has a sketch of the brewery on its label. 5.4% alcohol. 29 IBU. Plenty of roasted coffee along with a dose of sweet chocolate on the nose. Very smooth and creamy texture. Huge coffee flavor, and clearly a quality coffee product (I'm going to try that sample tomorrow morning to verify!). Chocolate flavors are secondary but a good complement to the coffee. Body is medium at best, not too rich or robust. Roast is present but tame, thankfully. Very simple. Also very pleasant, good flavors, enjoyable.